The ideal reader of Power Marketing: An Aussie Guide to Business Growth is a business owner who needs some practical advice on how to create better marketing. It contains a bunch of proven ideas to help grow your business into a leveraged, highly profitable company. You’ve got to use proven methods of copywriting and TEST your advertising and even your free offers. There are killer Cloud-based tools to help you keep costs down, while you get established. And what should an owner do before getting a business website designed? (p.99-104). 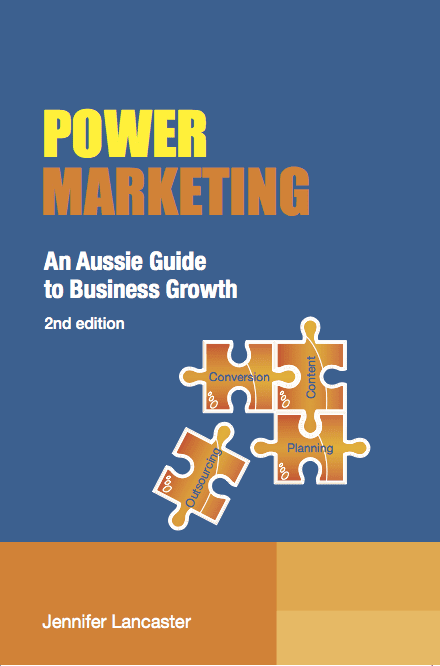 All the details are in my book, "Power Marketing: an Aussie Guide to Business Growth". Many service businesses lack solid 'sales funnel' systems that continually attract leads and then warm them up. Finding the right Cloud software and building strong content online can help service specialists get to the next level of marketing, which ultimately means more time freedom. The book helps out with some tips on useful, low cost software. Most business owners want to leverage their time to grow their business long term. Well you must employ simple, cloud-based technology. Then you can easily get savvy outsourcers to help implement it. Or, you can use the social sharing and scheduling tools of today, combined with your blog postings. In the old days, marketing meant advertising and promotion – en masse. Companies did not generally give first; they tried to sell (or brand) first. As more awareness of the sales funnel process has increased, more and more businesses are aware of the need to educate consumers before selling to them. Thanks to the low-cost nature of online marketing, incentive lead generation can be done cheaper than ever before, through such devices as Squeeze pages (email captures), Lead Surveys, Affiliate/Reseller partners, Email Autoresponders, Blogs with opt-ins, and free e-reports or eBooks. But don't forget that you are creating a network in your business... and people you know through social channels like LinkedIn and Facebook also have businesses. Some of them might have target markets (and email lists) that are simpatico with yours. Publicity is yours for the taking! In my line of work, this book has provided me the insight and the tips to successfully help my clients market their business. Ideal for new businesses or for someone looking to market their business in a modern way, Power Marketing provides in great detail what the different type of marketing strategies there is and how they can help your business. I especially like the chapter 'The best modern way to market your business.' It breaks down all the components of modern marketing which includes blogs, Social Media Marketing and Google Adwords and Google Maps and how to use it in your business. There is also a chapter on converting your sales and how you can use analytics and marketing to your advantage. I highly recommend this book for any start up business and for an existing business looking to use modern marketing techniques to their advantage. Australians, see our Power Marketing Kit offer, just $23 with postage and handling. All others, select your favourite bookstore retailer at the links to the left.